This was a piece written for a university composition and I chose to base it on the English 16th century genre 'In Nomine', based on the 'Gloria Tibi Trinitas' plainchant. 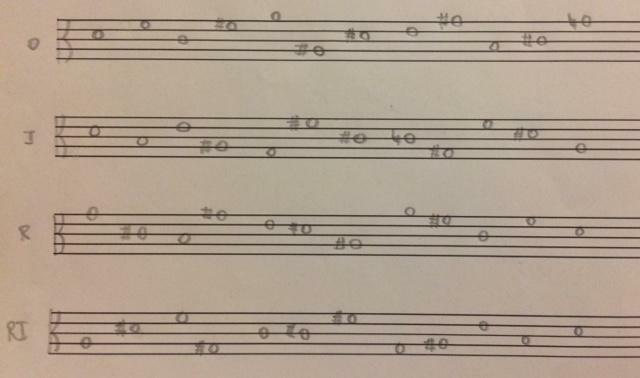 The first half is an English renaissance pastiche (with the chant melody in the viola throughout) and the second half is serial (see tone rows above). The cadence at the end of the first half is used as a rhetorical device to further emphasis the juxtaposition of the two styles. The structure within the pastiche A section is visibly and audibly binary, whereas the serial B section is a much looser 'free rondo' form. I tried to create some continuity between the two sections by incorporating the chant in the tone row (like Ernst Krenek did in his 'Lamentatio Jeremiæ Prophetæ'), however this proved difficult as a tone row with intervals largely resembling the chant did not create an effective row for serial composition (in my view).